I couldn't resist the gorgeous color combo this week at CR84FN Color Challenge and it's their very first official color challenge! Go check it out!! I don't use yellow that much but I was surprised how much I liked working with it and I love how well it goes with pink too! 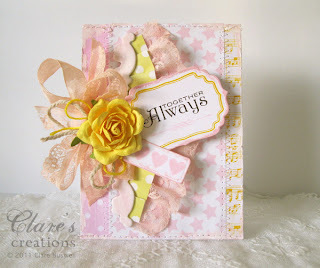 I used Spellbinders Labels 4 dies and teamed it with Very Vintage Labels 4 from Waltzingmouse Stamps, stamped in lemon yellow. The sentiment is from Fancy Phrases also from Waltzingmouse Stamps, the detail in pink is from the Very Vintage Labels 4 set too. The little pink hearts are from Sweethearts stamp set. The sweet pink stars paper is a digi paper Little Stars from Cupcake Cards & Craft, the pink polka dot paper and yellow dot paper are both from Flutterbies Dots by MKC at the Digichick. There's also a little bit of stamped Musical Backgrounds from Waltzingmouse Stamps in yellow. I used some peach lace and peach seam binding to bring in the peach color. Other: Spellbinders Labels 4, Tags Trio, Die cutting machine, sewing machine, acrylic paint in pink and white, tattered angels chipboard, peach seam binding, peach lace, pink lace, twine, yellow embroidery thread, Prima flower. Wonderful use fo this weeks colors, love that rose blossom! Thanks for playing at CR84FN! Gorgeous card Clare! Love the burst of yellow and beautiful WM frame and sentiment! Thanks for playing with CR84FN! Oh, my..this is just beautiful..Love every detail! A beautiful creation! You have quite the hand with embellishments without going overboard! Gorgeous card! Love the colors and your combination is fabulous. You are the QUEEN of layering! There is so many lush embellishments and it looks just wonderful. (sigh). Thanks for sharing! Clare!!! *THUD* I just fell outta bed because your card floored me! WOW! So beautiful!!! That yellow rose is just gorgeous!!! Lovely take on the colors! Thanks so much for playing along with CR84FN! Hope you'll play along with us again!!! Won't your Mom be delighted with her new sitting room! How wonderful to do that for her! 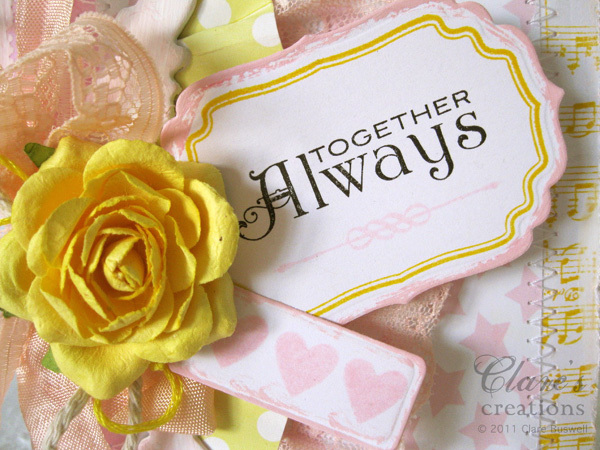 LOVE your card and that FAB yellow rose. REALLY LOVE what you did with your large label and the small heart label. FAB card! THX for playing with us at CR84FN! I love it! !Love the colors. Oh Clare, this is sooo beautiful, I actually gasped lol!I am struggling with this colour combo myself, You have done an awesome job with this, it's FAB! Another absolute stunner - I so love your creations so keep 'em coming! Clare - this is just wonderful! The rose is amazing and the lace and ribbons, just so feminine. 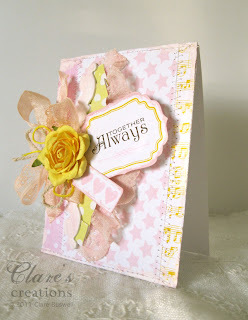 Love how you've used the WM stamps - what a sweet musical border!! Thanks for playing along with CR84FN. Beautiful card .. I knew straightaway what this was for before reading ... your colours are spot on! 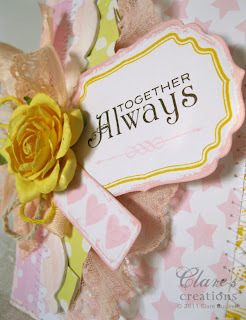 Clare this is just beautiful love the soft colors your flowers, ribbon and tag combo is stunning!! Just beautiful, Clare! LOVE the embellishments and how sweet this is.. Thanks for joining us at CR84FN! Clare this is a perfect and gorgeous take on the challenge; I love it. That yellow rose is stunning! How sweet of you to redecorate your mothers' sitting room! Beautiful, colours, layout, embellishments. I love everything about this card. Your work is amazing! !